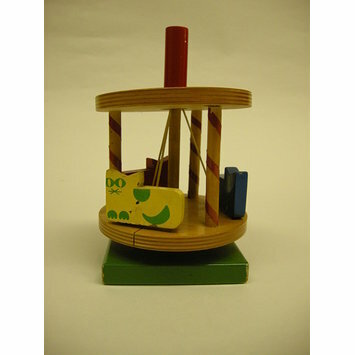 British toymaker Susan Wynter (1923- 2013) started making objects from wood when she was eight years old. Growing up, she lived in London near a billiard table maker where she would use the wooden off-cuts and leftover green baize to create her own objects. 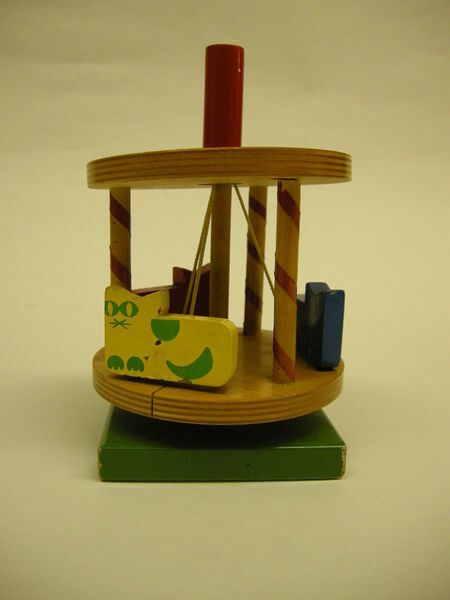 As Susan grew older and had children, she began to design toys for the nursery, focusing on both function and education. Through this new approach to toymaking, Susan Wynter began to gain international fame, exhibiting at the London Design Centre, the Venice Biennale, and in various trade fairs in British Pavillions. Her business, the Toy Trumpet, began as a small toy shop in St. Ives where Susan started designing and making high quality wooden toys. Through her toys Susan was keen to promote exploration through and also designed toys for children with special needs. These toys were then sold to stores like Harrods and Fortnum and Mason. In the late 1960s Susan moved the business to Essex and settled in Brightlingsea where she employed local people. The company grew exponentially, providing toys for major companies like James Galt and the Educational Supply Association. The carousel, a prominent figure in childhood toys, brings together a sense of wonder and nostalgia. In this carousel, Susan Wynter has taken the idea of the traditional carousel and updated it, making it both modern and fun. The rich colors and subsitution of cats for horses allows for an amusing and playful way to engage in an old classic. A moving carousel consisting of a square green wooden base on which a plain wooden round carousel sits. There are three cats attached to the carousel, all of them with painted features: eyes, whiskers, paws, tail and back. One of the cats is painted blue with yellow features, another one is painted red with yellow features and the third one is painted yellow with green features. The carousel is covered by a round roof that contains a hole for the center pole of the carousel. Around the top of the roof is flower like pattern. The roof and base of the carousel are linked by three rods on the sides which are decorated from top to bottom with red spiral stickers, and a central rod that in which half is painted red, and the other half is left plain. This rod joins the bottom and top of the carousel. There are three strings that join the base of the red cylinder, underneath the roof that connect each of the cats to the carousel.